When Thomas Jefferson sent a small naval squadron to the Mediterranean in 1801, he intended to intimidate the Barbary regencies into backing down from their claims of tribute in exchange for commercial freedom in the Mediterranean. Negotiations with the Barbary states hadn’t worked over the previous 15 years of American attempts, and the newly built navy was meant to show the world that America would take its place in the world economy by force. Algiers was responsible for the capture of American ships that had stultified American commerce in the Mediterranean, and its fleet of corsairs was seen as the biggest threat. The Americans had negotiated many times with the dey, but he often changed the terms of the negotiations on a whim. In 1789, Richard O’Brien, then a captive in Algiers who would become the American consul-general there, did not think it was worth trying to make a formal treaty with Algiers because the dey took so many liberties with the treaties he already had (though the United States did end up making a treaty). The squadron Jefferson sent to the Mediterranean in 1801 served two purposes beside defeating the Barbary states. First, it represented the American desire to one-up their European counterparts, who paid tribute to the Barbary rulers in exchange for free passage through the Mediterranean. But second, and more important, the Americans wanted desperately to be received as full members of the European community. The British and French were far worse for American trade than the Barbary states. But the Barbary rulers were viewed as bloodthirsty, capricious, and “not within the pale of civilization.” Fighting against them seemed like a literal and symbolic war that the Americans could win in order to show the Europeans that they could compete on a world scale. The war didn’t go well. When the American navy arrived in 1801, they learned that Tripoli was the regency who had declared war, while Algiers, Tunis, and Morocco remained threats. Fighting against Tripoli turned out to be a difficult task. The American squadron, supposed to be projecting strength, barely spent any time blockading Tripoli, and Tripolitan corsairs easily evaded the ships. Even when successive squadrons brought bigger forces, American forces were in unfamiliar territory, and it showed. Intelligence from the State Department was slow to make the rounds, and circumstances changed so quickly that the Secretary of State was essentially excluded; instead, the few consuls in the Mediterranean were left to keep the peace on their own. Keeping consuls in neighboring Tunis and Algiers proved difficult as well, so the Americans had to rely on uncertain relationships with their European counterparts in order to gauge the mood in the Barbary courts. By 1805, apart from a few spectacular events (some favoring the United States, some not), virtually nothing had been accomplished. When Tobias Lear finally negotiated a treaty with Tripoli, the high-flown rhetoric of victory without tribute early in the war gave way to the reality—the United States would pay Tripoli for the release of prisoners and peace between the two nations. It wasn’t until 1815, when circumstances were radically different in both the United States and the Mediterranean, that peace could be made without payment. Obviously, 21st century America is not 19th century America. But there are some parallels between our current president’s approach to foreign policy with North Korea and the way the United States approached the Barbary states. Perhaps there are lessons here, perhaps not. President Trump’s disdain for North Korean leader Kim Jong Un is obvious. His epithet “Little Rocket Man” strikes a similar chord as consul William Eaton’s dismissal of the bashaw as “the madman of Tripoli” (Eaton to Richard O’Brien, 15 September 1801. James L. Cathcart Papers, Library of Congress). And Kim does share the bloodthirstiness and capriciousness of the Barbary rulers. The Americans’ prejudices against North Africa caused them to discount the Barbary rulers’ capacity. Hopefully our current president doesn’t follow their example. The process of peace and disarmament with North Korea has been a hard problem for American presidents to untangle. Trump’s interest in North Korea seems to center on saving face for the United States (or, let’s face it, for himself). His behavior toward our allies in the world has caused significant damage to diplomatic relations elsewhere. In these negotiations, Trump can one-up the other powerful countries have not succeeded in convincing North Korea to disarm. So going after a common enemy might help to distract from diplomatic strife elsewhere. But just as American naval officers discovered after they constantly provoked and derided the European connections that made it possible for the Americans to stay in the Mediterranean, Trump may find that antagonizing his allies doesn’t bring the success he hopes for. Trump’s strategy of direct confrontation is a bit like sending a squadron into a territory where the intel is thin and the friends are few and far between. American strategy in the Mediterranean suffered because their diplomatic standing in the countries surrounding Tripoli was tenuous or non-existent. Likewise, not filling key State Department posts (such as the ambassador to South Korea) may place Trump in a situation where his intelligence on North Korea would be poor even if he wants to hear it. Keeping the peace with neighboring countries who are not friends while courting war with North Korea is an equally sticky task. Hopefully Trump has put more thought into relations with China, for example, than just tweeting. Nevertheless, the meeting with Kim Jong Un could be a positive development. Trump does have the element of surprise on his side (but his tendency to go off-script could go just as badly for the United States as for anyone else). However, Trump could learn caution from the Americans’ diplomatic meetings with the Barbary states, in which the Americans always went in assuming the rulers meant to meet in good faith, and on multiple occasions narrowly escaped with their lives and freedom. There are a few key differences between 1801 and 2018. 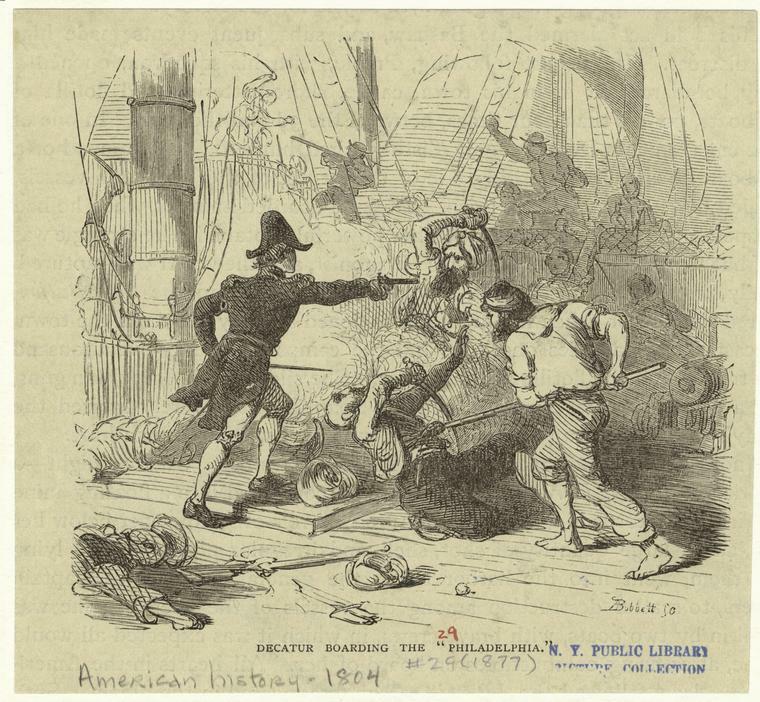 In the First Barbary War, the war was fought with short-range weapons and a small fighting force on both sides. The stakes are slightly higher when the potential weapons are nuclear warheads. In 1801, the United States really was a minor power. Now collateral damage from a conflict between the United States and North Korea could span the globe. Free trade and nuclear disarmament are both laudable goals—even necessary ones. I hope that President Trump goes into this meeting with North Korea, if it happens, circumspectly and with as much historical and contemporary intelligence as he can muster. He’s going to need it.